BREEVES Corporation has a long history of high quality, fast production and great value. 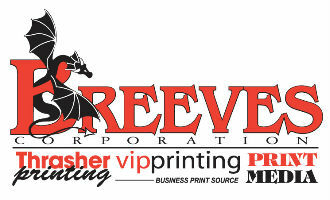 Over the years BREEVES Corporation has combined four great companies - Print Media, VIP Printing, Thrasher Printing and Business Cards and More. The combination of these successful businesses makes for a one stop shop for all your printing needs. In an effort to keep with the most current technology, we boast an up to date dual platform graphic department, latest models of production copiers & digital imaging, and computer to plate process. As we continue to keep abreast of the newest trends in commercial printing we will always pass on the value to our customers. We love what we do, we constantly strive to deliver the highest quality products possible.